Aim: The aim of the present study was to find out the measurement of real protection of ear muffs and as well ear plugs along with comparison of the efficacy of different hearing rotection devices (HPDs) in attenuation of stimulus levels for various stimuli by real ear attenuation at threshold method. Materials and Methods: Subject group consisted of ten males with the mean age of 20 years having normal hearing sensitivity (pure tone audiometry (PTA) less than 25 dB). Sound field measurement of thresholds was carried out for various stimuli, that is, warble tone, narrow band noise, and speech noise. Frequencies from 250 Hz to 12 KHz were tested in a sound treated room. For comparison, experimenter personally fitted the HPDs, that is, ear muff using experimenter fit method. Occluded threshold levels, that is, threshold of audibility for the test signals were measured in exactly same way as was done for open thresholds. The same procedure was followed for ear plugs also. Measurements were summarized at each frequency in terms of grand mean and a standard deviation of the protection values for both HPDs. Results: In all cases the mean attenuation was similar to optimum figures suggested in the literature, but the standard deviation was relatively high. Ear plugs produce more attenuation for low as well as high frequencies of warble tone and narrow band noise, but ear muff are better attenuators at mid frequencies for both warble tone and narrow band noise and also for speech noise stimulus. Conclusion: The attenuations provided by different types of HPDs vary across various nature and frequencies of that noise. This is to be kept in mind while suggesting for appropriate type of Hearing Protection Devices [HPDs] for optimal benefit. Exposure to excessive noise is the major avoidable cause of permanent hearing impairment. After presbycusis, exposure to loud noise is the second most common cause of hearing loss. The estimated cost of noise to developed countries ranges from 0.2 to 2% of the gross domestic product (GDP). Continuous exposure to high level of noise may produce both auditory and nonauditory effects. Noise-induced hearing loss (NIHL) is bilateral and symmetrical, usually affecting the higher frequencies (3, 4, or 6 kHz) and then spreading to the lower frequencies (0.5, 1, or 2 kHz). Other major nonauditory effects are lack of concentration, irritation, fatigue, headache, sleep disturbances, etc. Exposure to noise may be either occupational or nonoccupational noise exposure. The major industries responsible for excessive noise and exposing workers to hazardous levels of noise are textile, printing, saw mills, mining, etc. Occupational noise is a serious problem for the following two reasons: (1) The threat of loss of employment may convince people to remain in environments with noise levels higher than they would otherwise accept, and (2) in the workplace, high levels of noise may be sustained on a regular basis for many hours each day over many years. Worldwide, 16% of the disabling hearing loss in adults is attributed to occupational noise, ranging from 7 to 21% in the various subregions. The employer must administer a continuing, effective hearing conservation program whenever employee noise exposures are at or above an 8-h time-weighted average (TWA) of 85 dBA or, equivalently, a dose of 50% (OSHA, 1983). An effective hearing conservation program can prevent hearing loss, improve employee morale and a general feeling of well-being, increase quality of production, and reduce the incidence of stress-related disease. A personal HPD is a device designed to reduce the level of sound reaching the wearer's ears (Berger, 1986a). 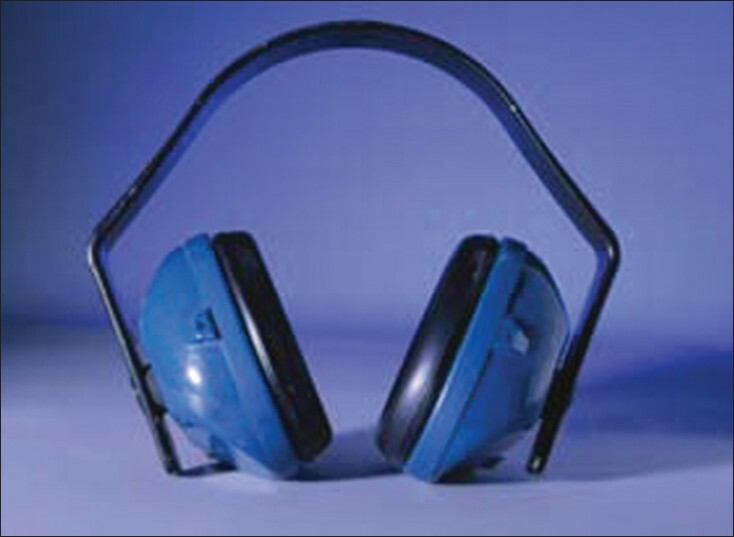 HPDs are considered as important option in hearing conservation program to control exposures to noise to industrial workers. HPDs are generally used during the necessary time it takes to implement engineering or administrative controls, or when such controls are not feasible. The employer must provide a reasonable choice of adequate embolic protection devices (EPDs) free of charge to all employees who are exposed to noise levels of equal or more than 85 dBA TWA (OSHA, 1983). HPDs are basically of two types: Ear plugs and ear muffs. 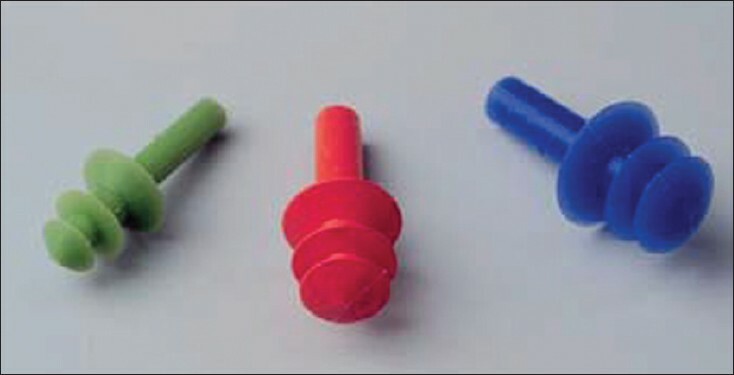 Ear plugs [Figure 1] are inserted to block the ear canal. They may be premolded (preformed) or moldable (foam ear plugs). Ear plugs are sold as disposable products or reusable plugs. Custom molded ear plugs are also available. There are four general classes of earplugs. These include: Premolded, formable, custom molded, and semi-insert. Premolded earplugs are made of plastic, silicon, etc., that have one or more flanges that provide a snug fit when placed into the ear canal. Formable earplugs are made of pliable material like polymer foam, silicon putty, etc., that form to size and shape of ear canal when they inserted. Custom molded ear plugs are unique for each person, since they are cast from each user's own ear canal semi-inserts are modified ear plugs held in place by a light weight plastic band. They provide least amount of attenuation. Ear muffs [Figure 2] consist of sound attenuating material and soft ear cushions that fit around the ear and hard outer cups. They are held together by a head band. The main difference between ear muffs and ear plugs is that ear muffs are not inserted inside the ear canal. Instead the muffs create a seal around the outside of the ear to prevent noise from reaching the inner ear. Ear muffs are easy to wear and often provide a more consistent fit than an ear plug. Physical attenuation method: Procedures described in the physical attenuation method are performed by physical tests on a dummy head and may also be used to measure sound attenuation at relatively high sound pressure levels. This is a secondary method. Real ear protection method: Procedures described in the real ear method are performed by psychoacoustic tests on human subjects and are designed to measure real ear protection at hearing thresholds for completely developed hearing protectors. This is the primary method. Real Ear Attenuation at Threshold (REAT): This involves human listeners whose sound field thresholds for octave bands of sound are recorded in both a protected and unprotected mode. Microphone in Real Ear (MIRE): Involves placing a probe microphone in the ear canal, medial to the protection being tested, and measuring the intensity of octave bands of sound in the canal compared to just outside the hearing protector. REAT is the preferred method, primarily due to variables stemming from microphone placement (location) in MIRE. Subject fit (ANSI S12.6-1997)  -here experimenter gives each listener precise instruction on fitting the hearing protectors, in accordance with instructions from the manufacturer. Ear plugs have to be inserted and ear muffs have to be put on by the listener. Experimenter fit (ANSI S12.6-1974)  -here experimenter personally checks each hearing protector installation to assure a good fit and acoustic seal after the subject has put on the ear protector. When he deems necessary, the experimenter reinserts ear plugs and readjusts ear muff to a best fit prior to testing, but not after the test has begun. In a study by Alberti et al.,  a series of workmen being evaluated for pensions for occupational hearing loss were asked to bring their own hearing protectors from work, to fit them themselves, following which attenuation studies were made. The muffs and most ear plugs produced similar attenuation levels at high frequencies, although the muffs produced less attenuation at low frequencies. The study on the difference in protection efficiency between earplugs and earmuffs by Erlandsson et al.,  shows a greater hearing impairment for 'muff-men' than for 'plug-men'. Under certain conditions earplugs provide the most effective protection although the attenuation is higher for ear muffs than for ear plugs. Measurement of real protection of ear muffs and ear plugs as well. Comparing the different protectors efficiency in reducing stimulus levels for various stimuli. Ten subjects with normal hearing sensitivity (pure tone audiometry (PTA) less than 25 dB in poorer ear) were taken with average age 20.2 years who did not have history and complaints of any ear infections and exposure to noise. No subjects were selected for test, the range on three successive open threshold measurements at any test band between the 250 and 4 kHz band was greater than 6 dB. Ear protective devices used were ear muff and ear plug. Audiometer-GSI 61 model was used for the study. Loudspeakers-Two loudspeakers were placed at a distance of 1 m from the listener at 45° azimuth. Acoustic environment of test room-The test was administered in a sound treated room of C U Institute of Audiology and Speech Therapy, Surendranagar, Gujarat. Third octave bands of these stimuli were used as test sounds for measuring real ear protection at threshold for the bands with the following center frequencies: 250; 500; 1000; 2000; 3000; 4000; 6000; 8000; and 12000 Hz for the warble tone and narrow band noise, while speech noise and white noise at a fixed frequency band. REAT method based on procedures of Indian Standards (IS), 1980,  was used for the study which is the primary method for the purpose. Listeners were completely informed regarding the test situation and procedure and a written consent was obtained from everyone. The listener was seated in such a way that, using head positioning reference device, the listener's head was placed in the same 'fixed' position in the sound field for all repeated measurements. Listener's threshold levels were obtained using the different stimuli listed above at different frequency bands given above with the listener's ears uncovered and unprotected. A threshold criterion was considered to be at 50% response level. Bracketing method was used to obtain the thresholds. Fitting hearing protectors: Experimenter fit method was used for obtaining the occluded thresholds of different stimuli at different frequencies. Processing and reporting the data-The measurements were summarized for each of the nine specified test frequency signals for the each of the test stimulus in terms of grand mean and a standard deviation (SD) of the protection values. Where, d is the difference between the grand mean and an individual observation and N is the number of observations. The data were summarized in a table displayed real ear protection at threshold and standard deviation as a function of the frequency of test stimulus. Ear plugs produce more attenuation for low, that is, at 125 Hz (for WT 3 dB, for NBN 4 dB), 250 Hz (for WT 5 dB, for NBN 4 dB), as well as high frequencies 8 kHz (9 dB for both WT and NBN), and 12 kHz (6 dB for WT, for NBN 4 dB). Ear muff are better attenuators at mid frequencies 1 kHz (5 dB for WT and 3.5 dB for NBN), 2 kHz (8.5 dB for WT, for NBN 7 dB), 4 kHz (7.5 dB for WT, and for NBN 10.5 dB) for both warble tone and narrow band noise. Ear muff and ear plugs produces similar attenuation at 500 Hz, 3 kHz, and 6 kHz by ±1 dB. For the speech noise and white noise stimulus, ear muffs are better attenuator than ear plugs by almost 3 dB. Measures are having high value of standard deviation and there is no uniform pattern of difference across frequencies. Considerable research has been focused on refining the attenuation properties of HPDs (e.g., Berger et al., 2003). The degree to which HPDs attenuate environmental sound energy across frequencies can be affected by many factors. Such factors pertain not only to the thickness and density of the material used in the ear protectors, but also to the level of bone conducted sound transmission. Typical HPDs without acoustic design modification, attenuate high frequency sounds more effectively than low frequency sounds. This is because low frequency sound energy would more freely enter the space between the ear canal wall and ear plug. This would not be an issue with circumaural ear muff HPDs. The three acoustic phenomena account for this frequency dependence. The first phenomena are that all frequencies with half wavelength less than the diameter of obstruction (e.g., HPD) are attenuated. As a result low frequency sound which have longer wavelength, more easily pass through obstructions, whereas high frequency sounds with shorter wavelength are greatly attenuated. The second phenomenon involves the impact of stiffness and mass. And hence it is sufficient to say that the greater the mass of HPD, the greater the overall attenuation it provides. The third phenomena pertains the resonator characteristics of ear canal. Hence, it is in agreement with findings of our study which will in turn give more information about the effective HPD for different environment with respect to intensity and nature of noise. From our present study results it can be concluded that, ear plugs produce more attenuation for low frequencies, that is, at 125 and 250 Hz as well as high frequencies 8 and 12 kHz; in contrast it was found that ear muffs are better attenuators at mid frequencies, that is, 1, 2, and 4 kHz. Although, ear muff and ear plugs produces similar attenuation at 500 Hz, 3 kHz, and 6 kHz, for the speech noise and white noise stimulus Ear muffs are better attenuator than ear plugs. Measures are having high value of standard deviation and there is no uniform pattern of difference across frequencies. It can be hence concluded that the attenuations provided by different types of HPDs vary across various nature and frequencies of that noise. This is to be kept in mind while suggesting for appropriate type of EPD for optimal benefit. 1. Occupational Safety and Health Administration, 1983. 1910.95 Occupational Noise exposure, 29 CFR 1910.95 (May 29, 1971) Federal Register 36: 10466-10466, Amended (March 8, 1983) Federal Register 48-9776-9785. 2. Berger EH. Hearing protection devices. In: Berger EH, Ward WD, Morril JC, Royster LH, editors. Noise and Hearing Conservation Manual. 4 th ed. Fairfax: American Industrial Hygiene Association; 1986. p. 319-81. 3. ANSI S12.6-1997 (R2002), 2002. Methods for Measuring the Real-Ear Attenuation of Hearing Protectors, American National Standards Institute, New York, NY. 4. ANSI S3.19-1974, 1974. American national standard method for the measurement of real-ear protection of hearing protectors and physical attenuation of earmuffs. New York: American National Standards Institute. 5. Alberti PW, Riko K, Abel SM, Kristensen R. The effectiveness of hearing protectors in practice. J Otolaryngol 1979;8:354-9. 6. Erlandsson B, Hakanson H, Ivarsson A, Nilsson P. The difference in protection efficiency between earplugs and earmuffs. An investigation performed at a workplace. Scand Audiol 1980;9:215-21. 7. IS:6229-1980, 1980 Method for measurement of real-ear protection of hearing protectors any physical attenuation of earmuffs. 8. Berger EH, Casali JG. Hearing protection devices. Taken from Malcolm J. Crocker Handbook of Acoustics. 1998. p. 799-813. 9. Berger EH, Kieper RW, Gauger D. Hearing protection: Surpassing the limits of attenuation imposed by the bone-conduction pathways. J Acoust Soc Am 2003;114:1955-67.